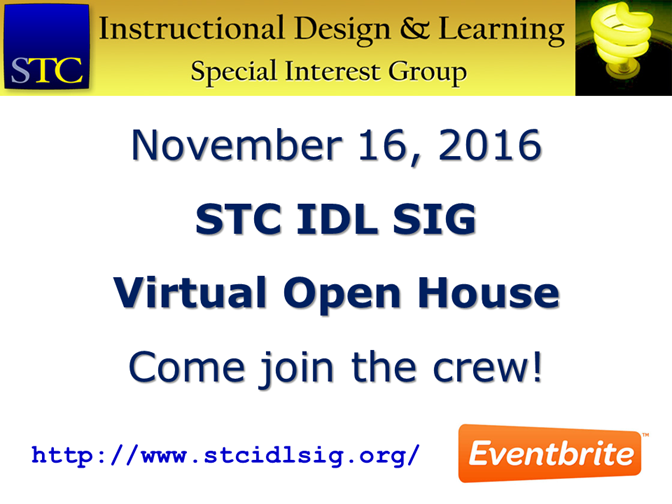 Join the IDL SIG online for our Virtual Open House! See the slides below or download the slides as pdf here or as a PowerPoint here. As a virtual community, with all of our members scattered across the globe, we do not have the same opportunities as geographically-based communities to meet up face-to-face. Since 2013, we have hosted the IDL SIG Virtual Open House (VOH) so that new and prospective IDL SIG members could learn more about our community’s mission and goals, learn more about member benefits, and meet some of our leaders and volunteers. During our VOH, participants have always had the opportunity to ask questions about the SIG and what we offer. This year, we’d like to try something new. We’d like to combine our VOH with a virtual party (VP), where we would encourage all attendees to share a photo or story. The VP (not be confused with Vice President!) we hope will add a very human, personal side to our VOH. Hey, it is all about making real, enduring connections! The webinar will be recorded so feel free to watch with us online and then rewatch at your leisure. No need to take notes. If you cannot attend, sign up anyway so that you will get a link to the recording. See the 2015 VOH recording and slides on our website. See the 2014 VOH recording on Adobe Connect. Next PostNext 2016 IDL SIG Demographic Survey NOW AVAILABLE!